Samsung R6 review | What Hi-Fi? While multi-room speakers are all about filling every room of the house with sound, the Samsung R6 is about filling every corner too. Designed to spread sound 360 degrees so people can ‘enjoy music freely as they move from room-to-room’, it’s rather unusual. In order to achieve even distribution, a 12.5cm downward-facing woofer fires sound towards a conical base, while in a 25mm tweeter on the R6’s peak acts in a similar fashion with a small, arched plate. And it works. With a nice open spread of sound from all directions, it doesn’t discriminate whether you’ve got the front-row seat or are in your favourite armchair off to the side. It’s a sound you won’t mind following you around the room, either. It traipses through Electric Light Orchestra’s When I Was A Boy with balance, clarity and enough space, integration and organisation to keep things coherent. Showing its dynamic talent, the track’s opening piano chords vault forward. Jeff Lynne’s melodic ramblings are articulate and solid in equal measure, and while the R6 isn’t the last word in conveying texture, there’s detectable detail within guitar chords. It applies enough weight and power to give the thunderous orchestrations in Hans Zimmer’s Gotham’s Reckoning (24bit/192kHz) their fair due, without giving the cold shoulder to the fainter trumpets underneath. It allows the Samsung to communicate the track’s deliberately menacing build effortlessly. For a humble speaker, the undertowing bass is deep and rumbling, if a little soft. The driving beat of Drake’s Hold On, We’re Going Home doesn’t kick quite as hard as it should, so a sprinkle of bass punch wouldn’t go amiss. Favouring refinement over outright attack, the R6 can feel a little too easy-going at times. 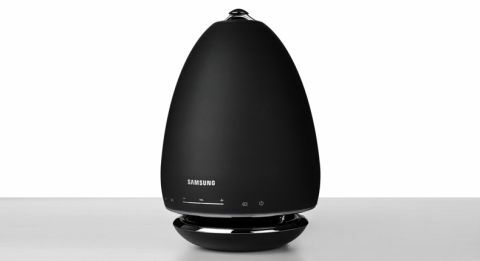 Samsung hopes you have a secure wi-fi network, because with no ethernet port or physical connections the R6 can only play music via wi-fi or Bluetooth. Audio from a Bluetooth-compatible Samsung TV can also be streamed directly to the R6 via Samsung’s TV SoundConnect feature. Whether you listen to internet radio or subscribe to a streaming service, Samsung has it covered with access to TuneIn, Spotify and Deezer, as well as the lesser-known 7digital and 8tracks services – all accessible via Samsung’s Multi-room app. Building your own digital library? Everything from low-res MP3s to WAV, FLAC and ALAC files all the way up to 24bit/192kHz can be played. The smaller, portable sidekick to the R7, the R6 has a six-hour battery life (it also runs off mains power) so you can DJ your afternoon picnic down the park. It’s small enough to tuck under one arm, although with the semi-exposed soft dome tweeter and a gap between the woofer and base, we’d be careful about shoving it in a bag, as you might do with the Bose SoundTouch 10. Across the bottom, a light indicates battery level, while touch controls are handy for switching inputs, pausing playback and changing volume. They require a bit of precision pressing – but a voice command lets you know when you’ve got it right. Given a 3.5mm jack and more sonic expression and energy, we’d be looking at the full star set. But the R6 achieves what it sets out to do: produce sound all around, seamlessly throughout your home and from a neat, well-equipped portable speaker.